My young daughters are both very loving and are often drawn to books that have the word ‘love’ in their titles. 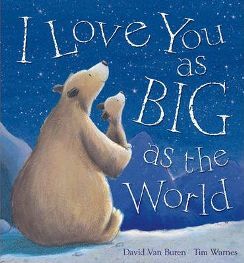 One of their favourites is ‘Guess How Much I Love You?’ by Sam McBratney, and so when they spotted ‘I Love You as Big as the World’ by David Van Buren and Tim Warnes I instantly knew that it would be a book that we would definitely be taking home with us. It certainly does fulfil its promise of being very cute – just as I expected. The book features another set of characters called Big Bear and Little Bear. I think I have lost count of just how many books we have, written by different authors, which feature these two characters. I don’t mind too much but you would think that they might strive for some originality! Anyway, there is no story as such in this book – just a series of lovely illustrations showing and saying just how much this pair loves each other! The first double page shows Big and Little Bear holding hands as a range of mountains stretches high and far in front of them with the text in large bold print stating ‘I love you as much as the world’. The next page shows the pair swimming in an ocean with the company of fish and words that state ‘I love you as deep as the sea’. This is the way it goes on through the pages with declarations of love ‘as bright as the sun’, ‘as blue as the sky’, ‘as long as the days’ and so on. The last declaration is ‘I love you as far as a star. I love you because you are you’. All of these expressions, along with some beautiful illustrations, demonstrate a gorgeous intimate relationship between the two bears that is bound to bring a smile to any child’s face as they are looking at and reading this sweet book. Both my daughters love the sentiments expressed in this book and they have started to adopt many of the declarations themselves and often come up to me and tell me that they love me as soft as the dew for example. It has also inspired them to make up some of their own as well! I think that they were a bit disappointed that there is not a story and this makes me feel that it is probably a book that might be suitable for very small children. Having said that though, there is a lot to commend this book to all ages not least the wonderful illustrations. These are quite whimsical and our favourite is one of the two bears lying together flat out under the sun with very contented looks on their faces. The text on the page is quite interesting too. It is big and bold and some words are bigger than others in order to draw attention to them or in the case of ‘I love you as far as a star’ the words get smaller towards the end of the declaration that illustrates how things look smaller the further away they are! I thought that was quite clever. The words also dance around the page a bit and in the case of the sentence I just mentioned they are seen going over a mountain in exactly the same shape as that mountain. Children’s eyes always seem to be drawn to words that do interesting things on the pages and this book is no exception. Also, there is a little bit of rhyme in this book but it is not immediately obvious. There are twelve pages with almost that number of declarations. These come in sets of four really with the second and fourth pages rhyming. As I said, you might not notice it but it is worth pointing out the rhyming pattern to young children and seeing if they can hear it. Overall, this book is cute and whimsical and beautifully demonstrates a very loving and tender relationship and I am sure that most small children will love it. We definitely recommend it! One Comment on "I Love You as Big as the World"